Over the summer we decided to take on our first woodworking project: building ourselves a bed frame. I love to try DIY projects, but I haven’t ever built my own furniture. 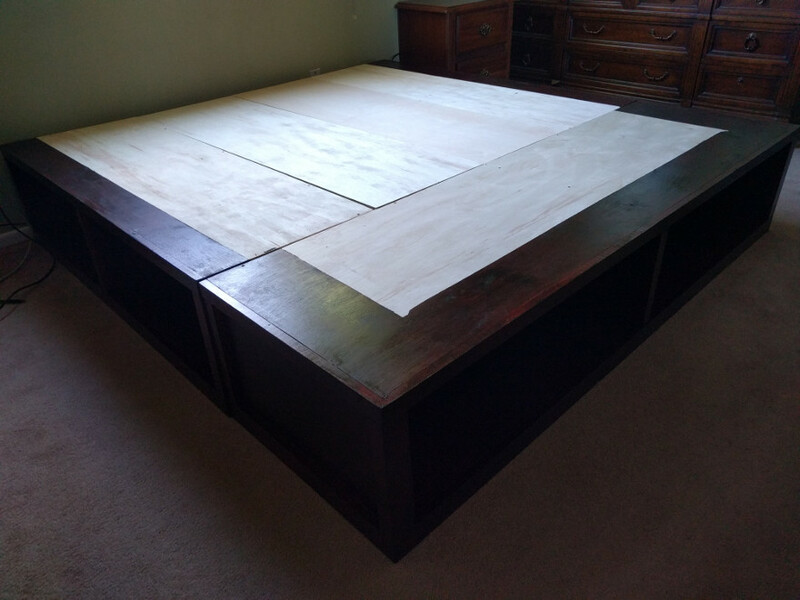 We were vaguely planning an upgrade to a king size bed, and the cost when shopping bed frames was making my frugal brain twitch – so we decided to take the plunge and try to build one ourselves. Our goals were to choose a relatively simple plan, keep it affordable, and build extra under-bed storage. We also wanted something that would look good with our other furniture, or future furniture upgrades. After browsing around for plans online, I finally landed on this plan, but decided to leave out the drawers for simplicity. Because this was our first woodworking project, I gave myself the long Independence Day weekend to complete the project. * somehow, a project always requires a new tool! Of course, I could have found a cheap or used bed frame for around the same price, but we know that it’s sturdy, reasonably well built, and we get to be proud of the fact that we built it ourselves. With a few long days of hard work we were able to complete almost everything, but with the wait time required for 2 coats of stain, we didn’t get everything put together ready to use until the following weekend. The wood was relatively cheap, we used mid-range 3/4″ plywood, but with the “mahogany” stain we applied I believe the finish looks pretty good. We definitely learned a few things about woodworking (including the fact that free online plans can have measurement mistakes! ), and I hope that on our next project we will finish things faster, and improve our building techniques. Not my most frugal project ever, but the end result has been everything I hoped it would be. We decided to get a Casper mattress when I found a $50-off referral link, and a $100 statement credit from Amex that brought the total cost down to $800. There were a lot of foam mattress options to choose from, but Casper has a great reputation, and seemed like one of the highest quality foam options. 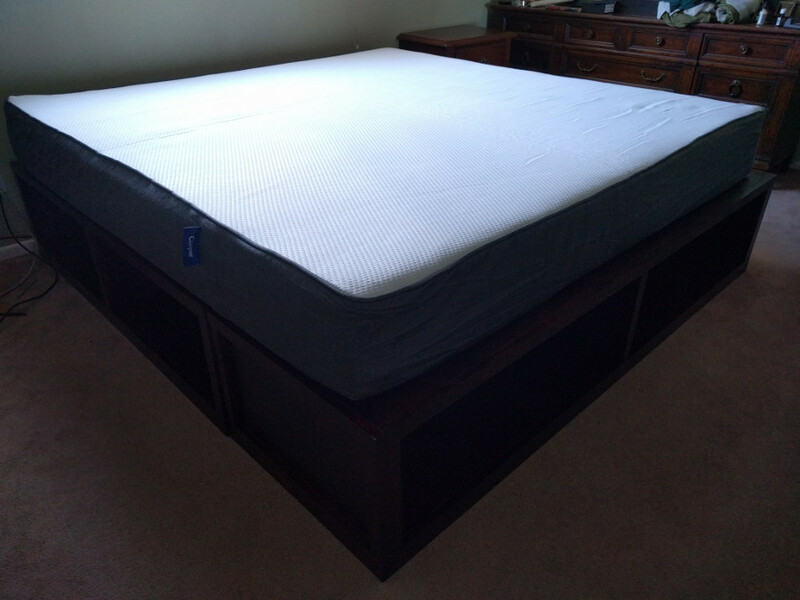 My favorite features actually have nothing to do with it being a Casper mattress specifically, I am really enjoying the extra space on a king, and the fact that movement during the night doesn’t wake me up as easily! If you’re interested in a Casper mattress yourself, consider buying via my referral link for $50 off (I will also receive $50 if you buy through my link). Have you ever built a piece of furniture? What do you think of our new bed frame?